James Sanpha Koroma, Grand Commander of the Order of the Rokel (GCOR) is an experienced Banker who has worked in the world of Finance for over 40 years. He has vast experience in the Banking Sector and has held various positions including Managing Director at the National Development Bank (NDB), Governor of the Central Bank of Sierra Leone, Alternative Executive Director at the African Development Bank Group and currently Chief Executive Officer of the Union Trust Bank. 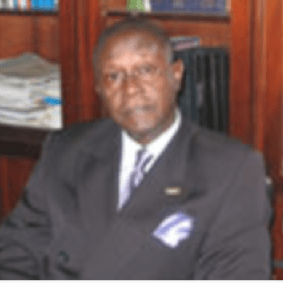 James Sanpha has a very notable footprint in the history of the financial sector in Sierra Leone as he was the founder of the first indigenous commercial bank, the Union Trust Bank in 1994 and was the bank’s first Managing Director. Mr. Koroma made other professional accomplishments between the years 1976 to 2001. He established the National Authorising Office (NAO) as their Senior Project Officer. He was involved in the Recapitalization and Commercialisation of the National Development Bank, moving them into profitability. He also took the lead as Project Consultant for the World Bank in the establishment of the Sierra Leone Road Transport Authority and also served as First Chairman of the Board of Directors in 1996. Between 2000-2001, he became the Principal Pioneer of National Social Security and Insurance Trust (NASSIT). Internationally, his consultancy assignments include offering professional advice to World Bank on the Divestiture of the Ghana Industrial Holding Corporation (GIHOC); and also to the African Development Bank Group for the Industrial Development Bank of Sudan Commercialisation Project. He holds a BA (Econs) Fourah Bay College – University of Durham; MA – Syracuse University, New York; MSc University of Birmingham, United Kingdom and DCL (Honors Causa) IBC – Cambridge, United Kingdom. James Sanpha is married to Mrs. Anne Konima Koroma and they have three sons. He is an accomplished Golfer, Squash and Tennis Player.